Sleep apnea is a fairly common condition with roughly 18 million adult Americans suffering from the sleep disorder. The condition is most often the result of an obstruction in the airway, which causes the air passages to narrow while sleeping. As a result, pauses in breathing occur numerous times per night. While anyone can suffer from the condition, those who are obese tend to develop sleep apnea. With roughly 65 percent of Americans now considered to be obese or overweight, there is a significant potential for the development of the sleep disorder. 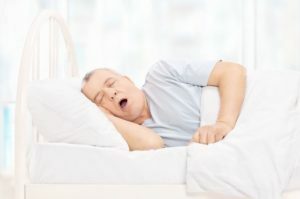 As your dentist for sleep apnea treatment in Mt. Holly, our team of dentists provide the treatments you need to protect your health and sleep quality. Sleep apnea is a potentially dangerous condition that results when pauses in breathing occur numerous times per night. As the airways become restricted, these pauses can occur hundreds of times per night with each event lasting as long as one minute or more. Over time, the lack of oxygen and decreased sleep quality causes many negative complications on your overall health and quality of life. When the condition is left untreated, your risk for cardiovascular disease, sleep deprivation, and many other serious and potentially deadly complications develop. There are a number of factors that increase one’s risk for developing sleep apnea. However, among the most common causes is obesity. Being overweight causes the condition to develop in a number of ways. For example, the increase in neck fat puts pressure on the airways, causing them to collapse. In addition, those who are overweight tend to have enlarged tonsils or an enlarged tongue, which cause the airways to become blocked. Research also shows that neck circumference plays a significant role in the onset of sleep apnea. Men who have a neck circumference of over 17 inches and women who have a neck circumference of over 16 inches are more prone to developing the condition. When obesity is the cause of sleep apnea, losing weight will often completely reverse the condition. However, losing weight is not an overnight process. While you work to shed the pounds, you will need to undergo treatment to protect your health from the complications of the condition. We provide sleep apnea therapy in Mt. Holly using CPAP machines and oral appliances. A CPAP machine uses a steady stream of air pressure to keep the airway open, while an oral appliance repositions the lower jaw to keep the airway open. Both forms of treatment are effective for preventing pauses in breathing to protect your health and quality of life. With the right treatment, you will sleep soundly at night while preventing the onset of additional health complications. Mt. Holly Family Dentistry will use the results from your sleep study to provide the effective treatment you need. We will provide the personalized solution that caters to your individual case of sleep apnea while also providing you with your preferred solution. Contact our office today to learn more about sleep apnea treatments.